Whether intimate or extravagant, dressed to the nines or a little more casual, indoors or out, the beautiful Pocono Mountains presents itself as a grand destination for weddings of all kinds. Spreading across four counties in beautiful Pennsylvania and home to 150 lakes including Lake Wallenpaupack and many quiet, small towns, the Poconos offers all the seclusion and charm you’re looking for in a fairytale wedding. From awe-inspiring ceremony sites that overlook a sparkling lake to large, open ballrooms with crystal chandeliers for your reception, these luxurious Poconos venues provides you with everything you need for a memorable event. As the winner of WeddingWire’s Couples’ Choice Awards for 2015, Ehrhardt’s Waterfront Banquet Center is a beautiful Poconos destination that will enchant all your guests. 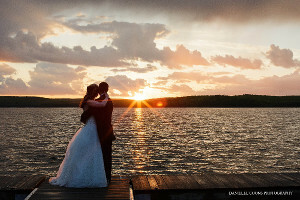 Resting on the shores of Lake Wallenpaupack, exchange your vows right as the sunsets over the water for a truly magical wedding celebration. Their elegant venue space offers floor-to-ceiling windows and a spacious deck right on the lakeside with plenty of space down the lawns to the water’s edge. Considered “The Land of Love,” Cove Haven Entertainment Resorts is a couples-only destination that lets you and your loved one trade in the hustle-bustle of the cities for the refreshing scenery of the Pocono Mountains. Here, you can plan a magnificent wedding celebration at one of their new onsite venues that include the intimate Bridal Chapel, their elegant Pocono Ballroom, or the outdoor Echo Lake Deck and offers stunning views of the majestic peaks. Combine your event with your honeymoon; luxury suites include seven-foot champagne glass whirlpool bathtubs, warm log fireplaces and more! Sariha’s Pick: With five onsite venues to choose from, Stroudsmoor understands that no two weddings are alike. While many will flock to the spacious Terraview, a grand stone castle atop Stroudsmoor Mountain, the quieter, more intimate Auradell stood out to me. This impressive mansion can host events for groups of 30 to 60 guests. The Auradell Grotto serves as a charming wooded ceremony venue with views of the town of Stroudsburg, while the reception will be held within the lodge and the bride and groom can enjoy their first dance in the beautiful solarium! Surrounded by over 325 private woodland acres in the northeastern part of Pennsylvania, the Lodge at Mountain Springs Lake Resort presents a secluded setting for your special celebration. A friendly wedding team is available to assist you through all the steps in creating a customized package for your event. Their beautiful outdoor venue rests on manicured lawns and overlooks a sparkling mountain brook and pond. Surrounded by apple trees and magnificent oaks, it’s a charming and intimate space to honor the start of your new life. After exchanging your vows, retreat to the beautiful lodge which offers great views and a comfortable space to celebrate. While many of the destinations on this list are luxurious Poconos resorts and inns, Zacharellis Gardens is a specialty event space catered for your wedding. This breathtaking estate is surrounded by stunning natural beauty, offering plenty of views of the mountains in the distance and groves of trees over 100 years old. Built in 1897 by Colonel U.G. 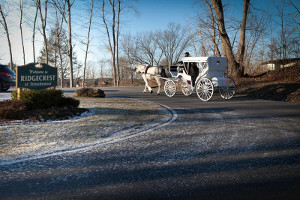 Schoonmaker as a home for him and his family, the estate has passed through several hands to become what it is today: a stunning Poconos destination where dream weddings come true. You’re sure to fall in love with the intricate stone work and hand-crafted architecture; the grand foyer and stained glass windows presents a magical place for your big day.